Plane ticket: booked. Destination: researched. Now it’s time to pack your bag and board the plane for that dream trip abroad. Just be sure to use these tips to pack for safe travel. Any adventure comes with some risks. But by packing smart and blending in, you can help minimize the risks of becoming a target of crime in other countries. 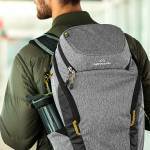 We spoke with Greg Wilson, a product designer at Kathmandu, about how to travel intelligently. 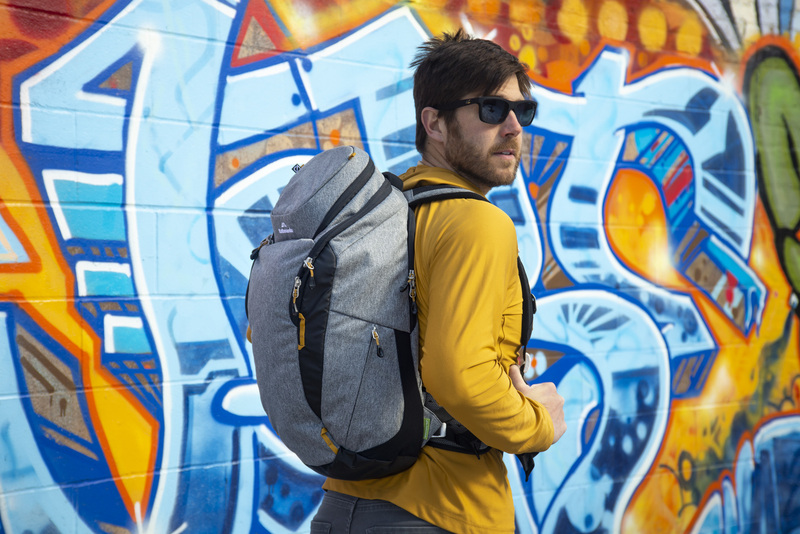 The Kathmandu team designed the Transfer Pack in Christchurch, New Zealand, as a storage option specifically designed for whisking around the world. So once you’ve got your trip planned, check out these tips to keep you safe during international travel. Before heading to the airplane, there are several things you can do to minimize travel risks. Starting months before your trip, visit your doctor or a travel clinic to catch up on any needed vaccinations. As your departure nears, check in on news articles and State Department advisories about your intended destinations. Photocopy and scan your passport, then email it to yourself. Leave one copy and scan with a trusted friend or relative. 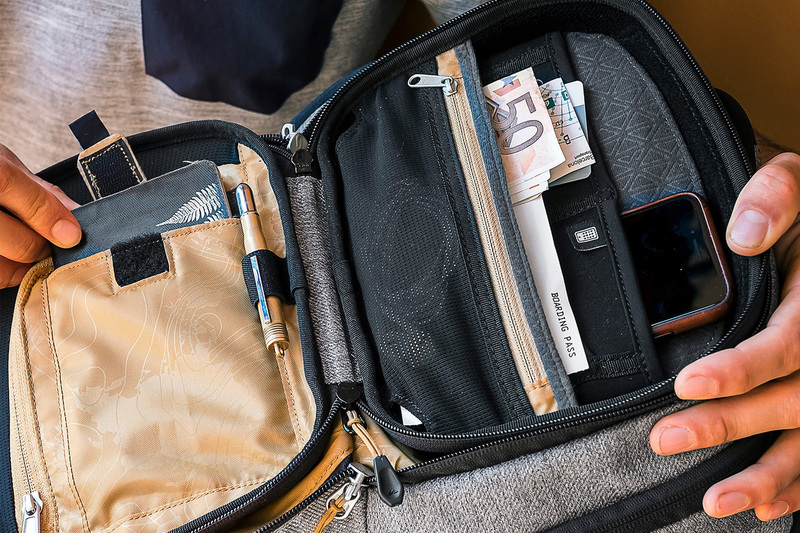 Stash another copy in a safe place in your backpack, away from your real passport. Travel can be hectic. Hopping in and out of taxis, through security checks, and on and off planes gives you lots of chances to misplace items. Here, a mental checklist helps you keep your most important possessions – passport, money, credit cards, health documents, etc. – safe. “Having the right pack can help with this and definitely has given me confidence,” Wilson told us. “Avoid opening packs and bags, or exposing all your contents in public places,” Wilson said. Opening bags can attract attention, especially on busy city streets. 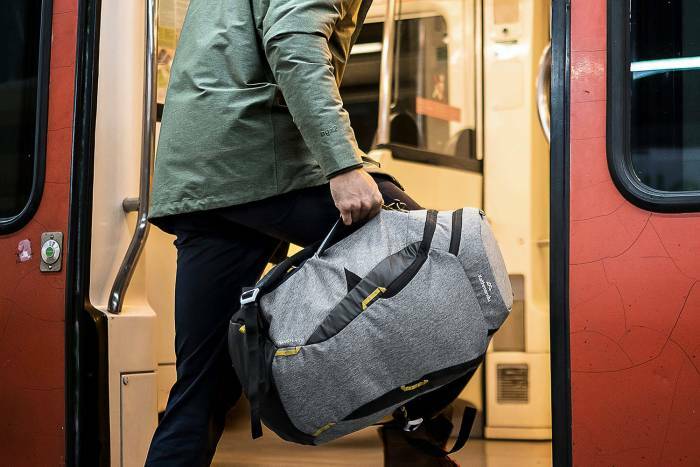 There’s an old adage that says “you will fill up whatever space your backpack will carry.” Thus, a smaller backpack will force you to pare down your load, a wonderful benefit when hopping on and off buses and trains. Unless you plan on significant hiking off the grid or camping, smaller is usually better for daily use. The Kathmandu Transfer Pack is a perfect size at 28 liters. It blends into your person with its subtle silhouette. “We wanted a look that was progressive, coupled with fabrics that were highly durable and delivered a more urban look,” Wilson said. Integrated travel features deliver security via anti-tamper and locking primary zippers. And a built-in rain cover, tuck-away hip belt, and breathable harness make it comfortable in the warmest climates. Depending on the credit cards you use, RFID skimming can be a risk. Your credit cards or passports can be scanned quickly if out of your view. Avoid handing your card over for prolonged periods and don’t let vendors handle your card out of eyesight. Carry your cards in RFID sleeves or in an RFID protective wallet to avoid skimming. If you’ve lived in a popular travel destination, you’ve seen the “lost wander” a thousand times. It’s when a person or group stops, pulls out a map or phone on the sidewalk, and looks around with a confused expression while trying to navigate a busy street. Avoid this by planning your daily outings before leaving your hostel, or at the table during breakfast or lunch. If you get lost on a busy street or market in a sketchy part of town, continue walking with purpose and pay attention to your surroundings. Find a business to enter before pulling out your map. You might even find the shop owner will sell you a great souvenir and help you on your way! A small bag can give you access to handheld devices and documents without pulling your entire backpack out of an overhead bin. On the Transfer Pack, a built-in, removable POD was the solution. This small case sits inside the pack and allows easy access. 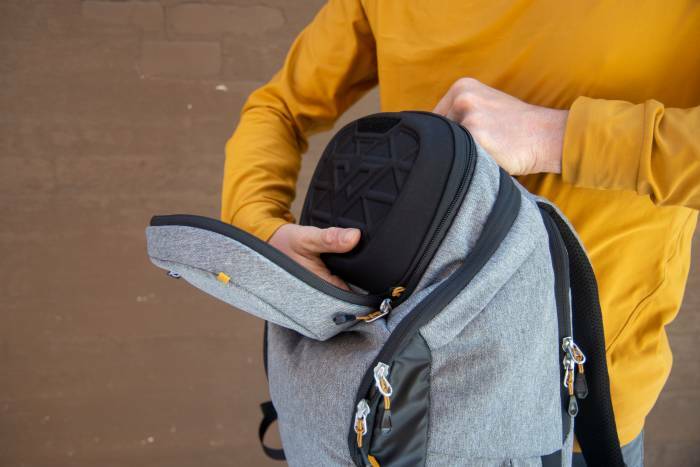 And it’s removable, so you can stow the pack and keep the POD on your lap or in the pocket in front of you in-flight. Before your trip, look at a bunch of photographs of the destination. Plus, conducting a Google image search for people in that location will give you a good idea of what locals wear. And while you don’t need to match exactly, dressing in a similar style will help you avoid drawing attention. Also, avoid tight-fitting clothing that reveals hidden belongings with lumps in pockets or around money belts. It should go without saying, but it bears repeating: Leave your valuables at home, or at least keep them concealed. Flashy watches, nice cameras, and jewelry attract attention and could be worth months’ wages in some countries. Your best bet is to leave them home. If you travel with expensive camera equipment, consider an insurance policy rider before your trip. Smile, Be Polite, and Have Fun! This article is sponsored by Kathmandu. 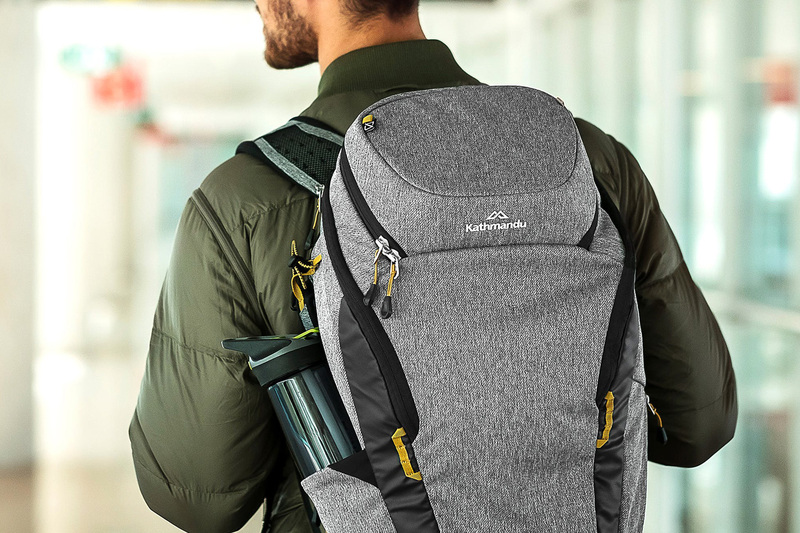 Check out its Transfer backpack and other travel gear here.